Dan Balz writes up Wendy Davis' helter-skelter campaign for the Washington Post. It has some truly impressive quotes from Obama's Man In Texas. Well, at least we have something to measure them against. However, this has been a standard refrain for about 15 years. You might recall that Tony Sanchez even dropped $80 million in 2002 (105 million in 2014 dollars) to test out whether there was any validity to this theory. Jeremy Bird, who set up Battleground Texas, said there is a path to victory for Davis: turning out registered minority voters who often stay home; registering unregistered minority voters; and attracting the support of suburban white women. She will do better among African Americans and Hispanics than the polls now show, he said. Maybe Steve and Amber Mostyn are fooled by this, but to the rest of us this sounds preposterous. Turnout registered minorities? You mean, white liberal Wendy Davis of the abortion filibuster is going to convince "minorities" to turnout to vote more than Obama did? Keep in mind that Bird's definition of minorities means that most of the group is Latino. Yes, not only is Wendy Davis is going to succeed where Obama failed when it comes to turnout, but she's also going to find people who don't care enough about voting to even register, and she's going to convince them to register AND vote. Yes, abortion radical Wendy Davis is going to do the previous two things...and then get weak Republican suburban white woman to vote...for Wendy Davis? Someone has been spending too much time in Austin. The first two parts were at least correlated. But the third is uncorrelated at best with the first two, and probably negatively correlated. Some messaging needles can't be threaded, especially when you've got a voting record as liberal as Wendy Davis. Abbott, they argue, is more conservative and less skilled as a politician than the man he seeks to replace, Gov. Rick Perry, and has been thrown on the defensive repeatedly during the campaign. This is rich. Maybe Jeremy Bird was too busy working for Howard Dean, John Kerry and Barack Obama to notice that all of his predecessors have spent the last 15 years labeling Rick Perry as an extremist and an idiot. Governor Goodhair, Governor 39%, etc etc. "He wasn't elected to governor, he has no chance in 2002 against a Bush fundraiser who will throw money at the race." "He only won 39%, he's dead." "He only won in 2006 because Kay decided she Washington, DC needed her." "Kay will destroy him in 2010"
But now that Rick Perry is leaving, they want to forget "oops" and lionize Governor Perry as the opposite of everything they've said for the last 15 years. Eses Norteños agrandados tendrían que pasar algunos años más en Texas antes de pensar que aún tienen idea de cómo pensamos en Texas. Notice that massive crucifix she's wearing in the Spanish ad? It has conspicuously disappeared for the English ad. I'm confident that I'm not the only one who has never seen Van de Putte wearing such a big cross. With all that said, it's a pretty good ad that probably achieves its aims. Better in Spanish than English. 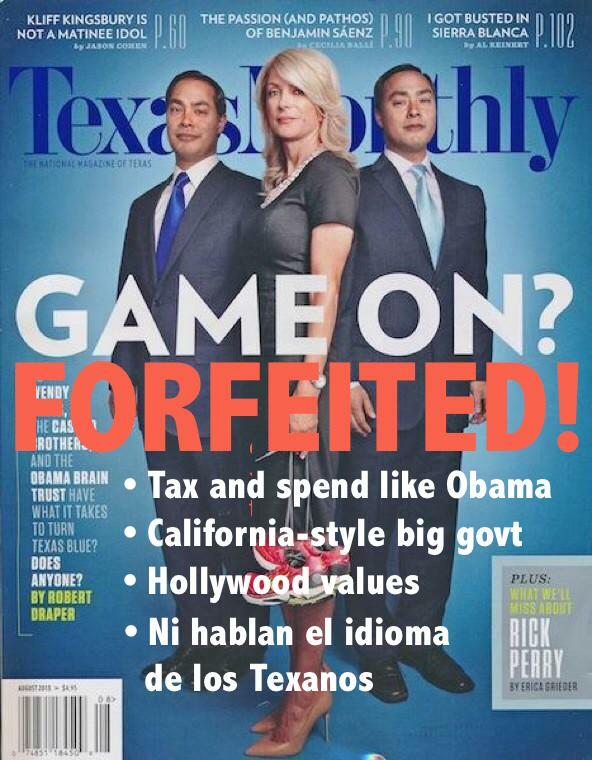 This was the alternate cover for the Texas Monthly edition. In the name of journalistic accuracy, they probably should've chosen the alternate cover.